I found it hard work now to pray to God, because despair was swallowing me up. He that lives in sin and looks for happiness hereafter is like him that soweth cockle and thinks to fill his barn with wheat or barley. My Sword, I give to him that shall succeed me in my Pilgrimage, and my Courage and Skill, to him that can get it. My Marks and Scars I carry with me, to be a witness for me, that I have fought his Battles, who now will be my Rewarder… As he went, he said, Death, where is thy Sting? And as he went down deeper, he said, Grave where is thy Victory? So he passed over, and the Trumpets sounded for him on the other side. He that is down needs fear no fall, He that is low no pride. He that is humble ever shall Have God to be his guide. For though when he was here, he was Fool in every man’s mouth, yet now he is gone he is highly commended of all. Now Giant Despair had a wife, and her name was Diffidence. Hanging is too good for him, said Mr Cruelty. It beareth the name of Vanity-Fair, because the town where ’tis kept, is lighter than vanity. This miry slough, is such a place as cannot be mended: It is the descent whither the scum and filth that attends conviction for sin doth continually run, and therefore is it called the Slough of Despond. Oh, the diligence of Satan! Oh, the desperateness of man’s heart ! 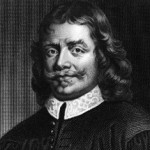 John Bunyan was born in Elstow, Bedfordshire, England. He was an English author, novelist and preacher best remembered as the author of the Christian allegory The Pilgrim's Progress (novel). His other works include doctrinal and controversial writings; a spiritual autobiography, Grace Abounding to the Chief of Sinners and the allegory The Holy War (novel). He wrote other books include: The doctrine of the law and grace unfolded, A treatise on the fear of God, The Life and Death of Mr Badman, The Jerusalem sinner saved, and The work of Jesus Christ as an advocate.